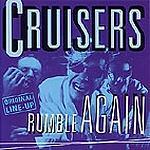 After all these years: THE CRUISERS ARE BACK! Unglaublich, but true, ha...auf dieser Scheibe tummeln sich lauter unveröffentlichte (never released before) Perlen aus der Zeit 1986 - 1990!!! Lediglich den "Weihnachtsmann" gab's schon auf Vinyl. incl. : Brand New Cadillac, Gonna Rock, Hot Rod Story, Now She's Gone, Can't Stop Thinking Of You, 16 Miles From Nowhere, When The Sun Comes Shining, Tonite's The Nite, My Babe's Leaving...15 SONGS!